1. How to check, which parts have the created CAM technological operation, and which do not? 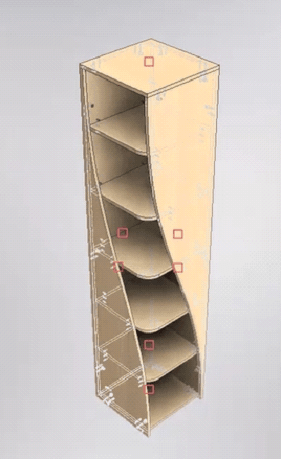 Open the designed model; Woodwork for Inventor plug-in materials must be assigned to its parts. Then, in the Woodwork Design toolbar, click the “Status for First” button. Once you click this button, the entire assembly (model) will be analysed and the CAM status of each part will be displayed. : means that the part has never been opened in the CAM environment and has no CAM technological operation created for it. : means that the part has a CAM technological operation created for it. : means that the part has been opened in the CAM environment, but the user closed it without creating any technological operation for it. 2. How to configure CNC machine? 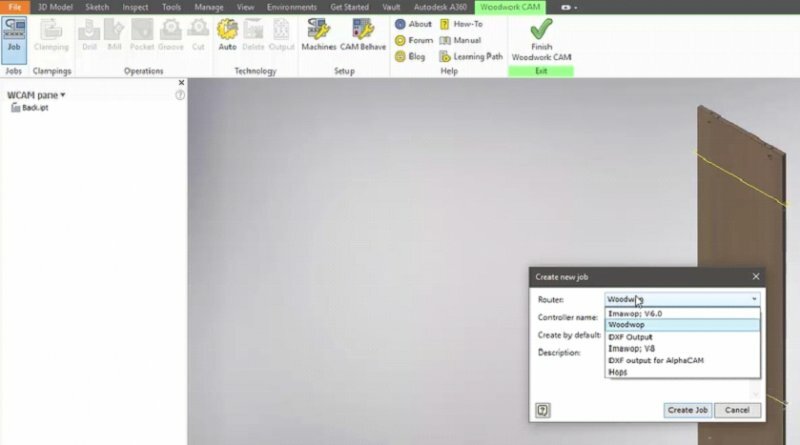 Click on any part of the project; this part will automatically open the CAM environment. Then, click the “Machines” button. 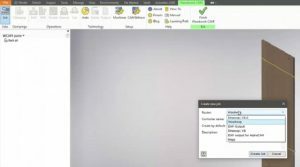 This will open the CNC machine settings window; here, use the Tool Pool tab to edit the settings list and its content. All the necessary tools and their parameters are entered here. Normally, any adjustment needs to be performed only once or, where changes to the configuration of the CNC machine have been made. In the CNC spindle settings window, you can indicate its code, rotation speed, rotation and tilt angle, etc. Later, tools can be added to the spindle. It is also possible to set the permitted spindle rotation angle in the horizontal and vertical plane. This is how possible spindle orientations are defined. In the CNC machine settings window, you will find CNC Machines tab, which allows creating new CNC machines or configuring the existing ones. Post-processors can be assigned to CNC machines; it is also possible to configure spindle travel and rotation as well as assign various tools to them. 3. 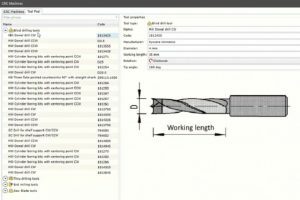 How to select a CNC machine, and create a program? Creating a Job. Go to Woodwork CAM environment and click the “Job” button. 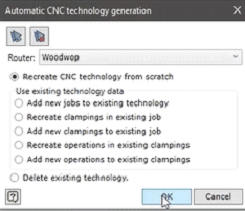 Then, in the newly opened dialog box, select previously configured CNC machine. The machine can be selected as default. Once you have selected the CNC machine, click the “Create Job” button. 4. How to create a base point? Click the “Clamping” button and select the clamping angle of the part in the CNC machine. From the pull-down menu, you can select the status of the processed object, e.g. workpiece with full edge banding, workpiece with coatings or without any coating, etc. Similarly, you can select the part status, e.g. with full edge banding, with or without coatings, etc. 5. Hot to configure the processing operations? Activate the “Drill command and, from the pull-down list, select a spindle. Or you can use all spindles using the “Use all spindles from list” option. The diameter and type of holes that can be processed depend on the choice of spindles and tools assigned to them. Then, from the list of holes, which can potentially be processed, select holes, which will be drilled. Moreover, you can select all the holes at once. 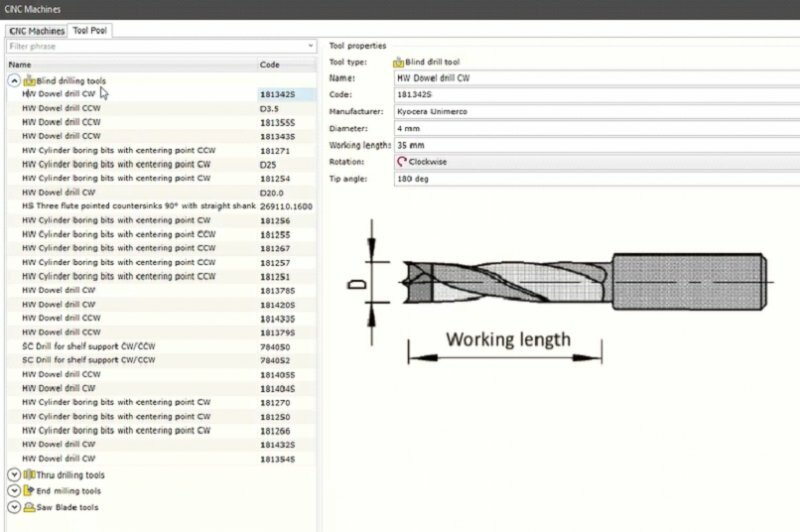 Once you have configured the required processing operations, click the “Finish” button in the Woodwork CAM toolbar. 6. How to automatically create CAM technologies for all parts? 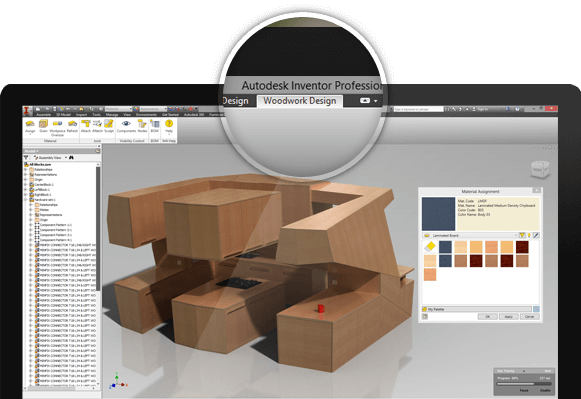 In the Woodwork Design toolbar or Woodwork CAM toolbar, click the “Auto” button. 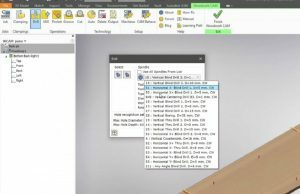 In the newly opened CNC technology generation dialog box, select a router and click the “OK” button. Next, the automatic CAM technologies will be automatically created for all parts. To check, whether the CAM technologies were correctly created for all parts, repeat all the steps described in paragraph 1. 7. 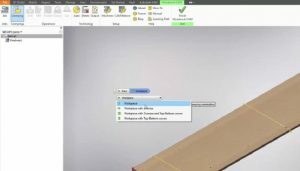 How to create a CNC program file? In the Woodwork Design toolbar or Woodwork CAM toolbar, click the “Output” button. 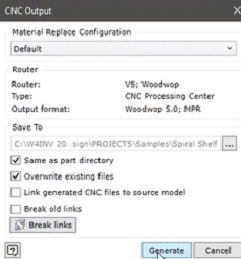 In the newly opened CNC program file dialog box, click the “Generate” button. Once the files have been created, you can open their directory. In this case, you will get files with .mpr extension, which is used for Homag machines. Once you open any of the generated .mprfiles, you will see that the part has been prepared for processing. play_circle_filled 1. How to check, which parts have the created CAM technological operation, and which do not? play_circle_filled 2. How to configure CNC machine? play_circle_filled 3. How to select a CNC machine, and create a program? play_circle_filled 4. How to create a base point? play_circle_filled 5. Hot to configure the processing operations? play_circle_filled 6. How to automatically create CAM technologies for all parts? play_circle_filled 7. 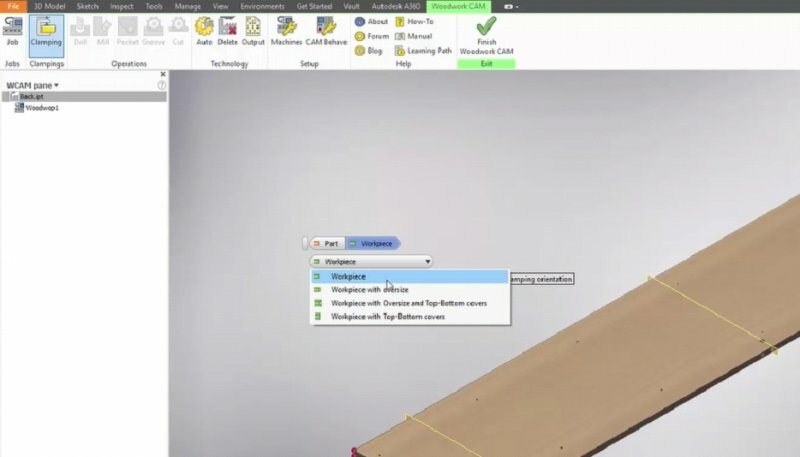 How to create a CNC program file?